Rishab & Raina Fight! Brahmarakshas 14th August 2016 Episode Written Updates :- Brahmarakshas which is comeback show of Krystle D’Souza, is gripping, although the show is actually stealing show now with its everlasting theme. As we already aware of it that the story of the horror TV series Brahmarakshas starts with newly-wed bride and groom Aparajita (Kishwer Merchant) and Parag Tyagi, speaking in their Haveli, in Kamalpura. Now on their wedding night, it is actually Aparajita is shown herself that she is a greedy person, who kills Parag for the property. Aparajita pushes Parag from the top of Haveli and then he has been killed by a gorilla! The story then takes a leap of 20 years, and Parag is now became Brahmarakshas, who will haunt the village. A new family in the place arrives as in the village it is Ajay (Sahil Uppal) and Rakhi’s (Charu Mehra) marriage has been fixed in the village of Kamalpura. 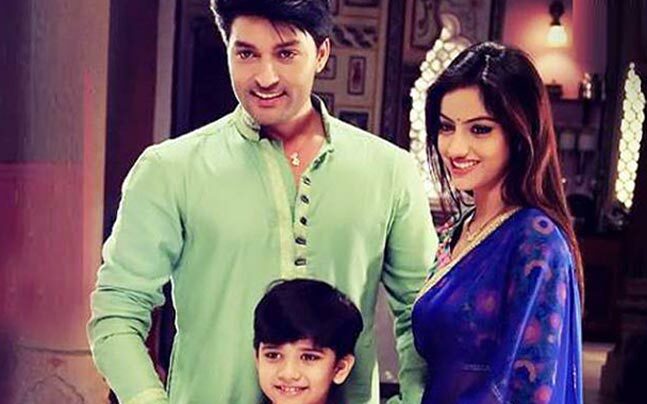 But, Rishabh (Aham Sharma) and Rakhi’s mother, Mohini (Rakshanda Khan) is hesitant about the place, but when the family insists they arrive in the Kamalpura. But Mohini’s brother, who wants to get rid of the village and the Hawvli, now decided to sell the property as he consider it as an inauspicious. Now the families shift to Kamalpura for the destination marriage. Mohini makes sure that there should be no red bangles, sindoor, and red chunari. She also argues with their sons, who bring alcohol, which Brahmarakshas hates it but Mohini can’t explain this to her son as her son won’t believe the same. But, somehow Raina (Krystal D’Souza) gets the bangle in her bags, thinking the family forgot it. Raina and Rishabh miss their train and they decided take a taxi, and asked driver to go in short cut but the driver refused for the same as there is Brahmarakshas is in the short cut road. Rishabh decides to go in the jungle route, and Raina will be given a lotus for her protection as Brahmarakshas is scared of it. Mishti and Shyam, who were with Rishabh and Raina take another route and now they reached in the Haveli where Shyaam and Mishti both had been killed by Brahmarakshas and Brahmarakshas possessed Shyaam. As Mishti arrives in front of Brahmarakshas in the attire of a Dulhan, last night Raina has been trapped by villagers and actually she bumps with the Brahmarakshas. Already Rishabh is now busy searching her so it will be interesting to see that whether Rishabh will be able to save Raina.